The retailer detailed a three-year rebound plan after closing the books on a tough fiscal 2017. You have to spend money to make money. That's a maxim investors understand well, and it is one reason individual stocks frequently rally even as their profits decline. Spiking short-term costs are acceptable if they're helping build a stronger long-term market position. Wall Street isn't as forgiving when earnings drop in the context of shrinking sales, or when the profit slump lacks a clear ending point. That's essentially the situation Bed Bath & Beyond (NASDAQ:BBBY) investors find themselves in today. 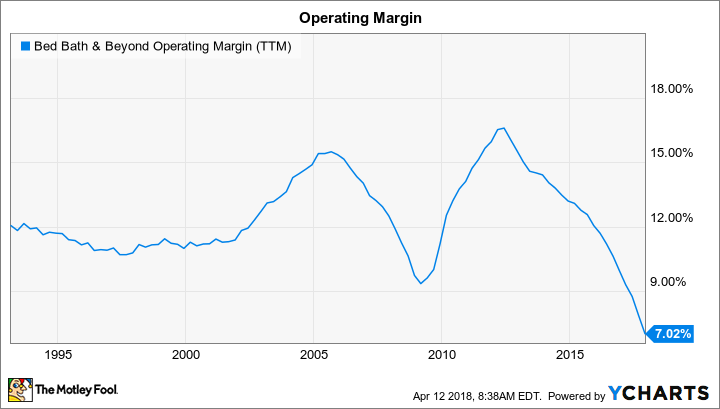 BBBY Operating Margin (TTM) data by YCharts. It wasn't all bad news in this report. Inventory levels declined sharply, which means the retailer entered the new fiscal year unburdened by aging merchandise it needs to unload through the heavy use of coupons. Instead, CFO Sue Lattmann said in a conference call with analysts that current inventories are "tailored to meet the anticipated demands of our customers and are in good condition." The retailer is aiming to return to slight sales growth this year, mainly thanks to gains in the e-commerce business. But that success would mark just the first, tiny step in a three-year transformation initiative that -- if all goes according to plan -- will begin delivering modest earnings growth by fiscal 2020. Given that weak and uncertain outlook, it's hard to see how this cheap stock doesn't continue drifting lower from here.